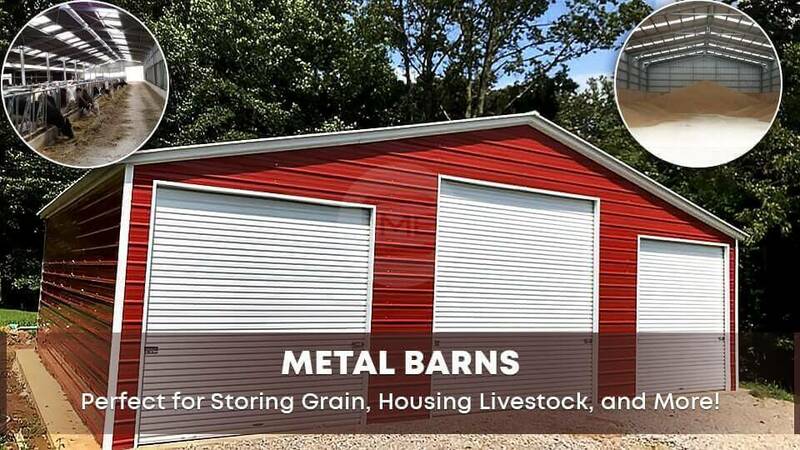 Why a Metal Barn Building? The word “barn” tends to bring up an image of an old, red, wooden building in some stage of disrepair out in a field somewhere. But thanks to modern technology and building materials, those days are long gone! The modern farmer or rancher can’t afford to spend a lot of time maintaining a barn when you’ve got crops and animals to tend to. Wouldn’t it also be nice to have a barn that’s easily expandable and adaptable as your farm grows or your needs change? Metal Barn Central can help you custom design a metal barn that is much more functional and longer-lasting than any stick-build! Our structures are extremely rugged and versatile, and are fully customizable according to your needs and preferences. You can also choose from different roof styles and from many different color options. These precision-engineered steel structures are known for their strength, durability, & cost-effectiveness as compared to barns made with wood or other materials. Metal barns are easier to clean and require less maintenance than stick-builds or other structures, making them a fantastic choice for agricultural applications! And since the colors are infused into the metal, you don’t have the same peeling or fading paint issues that come with a wooden barn, either. Steel barns don’t rot like wood, and they perform well even with constant use. They can also withstand almost anything Mother Nature might throw at them, be it wind, rain, snow, or lightning. Metal barn buildings are better designed for withstanding earthquakes, too. Steel isn’t susceptible to termites or other pests, and it doesn’t harbor mold or mildew. Steel is also incredibly fire resistant. The versatility of steel allows for more complex architectural designs and more clear-span interior space. It’s easier to expand your metal barn or building as your space needs grow, too. Thanks to superior strength, durability, and fire resistance, your insurance costs may decrease if you choose a steel building over other options. That’s another cost benefit you get by choosing a structure from Metal Barn Central! One of the first things you need to decide when choosing a metal barn is how you plan to use your building. One common application for our metal barns is a dedicated space for dry storage. You’ll want to consider how much space you’ll need to be able to accommodate your hay, grain, supplies, or anything else you’d like to keep under cover. It’s also a good idea to include some extra space to allow for future needs or additions. Prefab barns are available at Metal Barn Central in any custom size to fit your needs. We can provide everything from a small barn to a garage big enough to house your combine harvester! Not sure what size metal barn you need? Not a problem! Just reach out to one of our friendly and knowledgeable building specialists, we’ll be happy to listen to how you want to use your building, and then we can suggest some design options that will be sure to meet your needs AND your budget! Apart from dry goods storage, another common application for our metal barn buildings is as a livestock housing facility. One advantage of a metal barn is its steel framing, which is strong enough to be self-supporting without any need for interior posts or columns. What this translates to for you is more usable interior space per square foot. Our steel structures can also be designed to allow for more natural air flow and natural lighting, two features that make for a much healthier environment for your cattle, chickens, hogs, or whatever other livestock you may keep. At Metal Barn Central, you have the ability to design your own custom metal barn or other steel building from the comfort of your couch with our state-of-the-art online 3D Building Designer. With our 3D Building Designer you can create a design, save it for future reference, share it to your email or social media, and even process your own custom order! Check it out for yourself, and start playing with the possibilities today! And if you’d prefer just to talk with a live human, our friendly, knowledgeable building specialists are here to help! We’re happy to walk you through the whole process, from design to ordering to production to installation. Reach out to us online at Metal Barn Central, or give us a call at (980) 321-9898 and let’s get started on designing the metal barn of your dreams today!